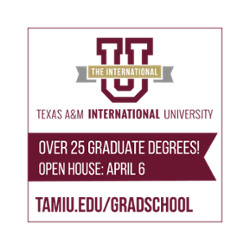 Over 25 graduate programs will be featured during Texas A&M International University (TAMIU) Graduate Studies Open House Wednesday, April 6, from 5:30 – 7:30 p.m. in the Student Center Ballroom. The Spring Open House is free and open to the public. Suzanne Alford, director of Graduate Recruiting, said the Graduate Studies Open House is an annual event and participants can get information on both traditional and online graduate programs, as well as interact face to face with faculty. Among advantages to earning a master’s degree are an increase in salary, promotion and the attainment of crucial job skills and knowledge, Alford said. To increase student access, TAMIU offers a flexible entry program during Fall and Spring semesters, which allows for dynamic class scheduling convenient to students. Registration opens for Maymester, Summer and Fall classes Monday, April 4. Registration deadlines vary according to each term. Refreshments and door prizes will be provided during the Open House. For more information, please call the Office of Graduate Studies and Research, at 956.326.3020, e-mail graduateschool@tamiu.edu, click on www.tamiu.edu/gradschoolm or visit offices in the Student Center, room 124. 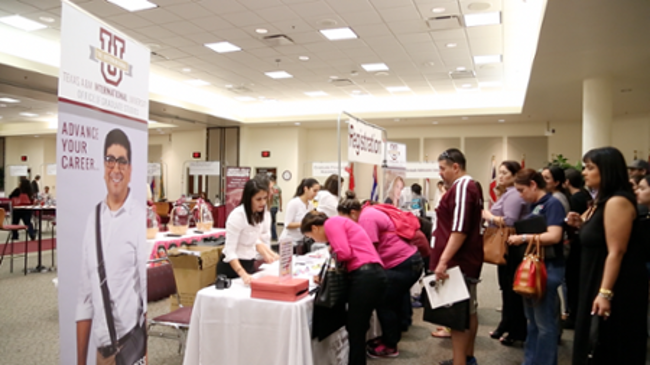 Over 25 graduate programs will be featured at TAMIU's Spring Graduate Studies Open House.